Made from the stronger SUS-304 (18-10) steel - it is durable and without compromise when juicing vegetables, leafy greens and firm fruits. When juicing it is easy to overload when juicing softer fruits and wheatgrass, the Angel Juicer 5500 automatically senses the additional pressure build-up by measuring the speed and reverses out automatically to prevent blockages. This stops too much pressure building up inside the machine which could possibly damage the juicing screen. All these models are still best used in conjunction with the optional coarse screen when juicing quantities of softer fruits. Twin Gear juicers are slightly different from other slow juicers as they utilise a triturating action, they grind the fruit and vegetables down more thoroughly than any other kind of juice extractor, ejecting a fine, drier pulp with less colour remaining in the waste (proving more nutrients have gone in to the juice). It features a three stage extraction which first applies pressure to crush the produce by grinding the food so it is thoroughly masticated, it then passes through a mixing stage to combine the various juices before the juice and fibre are separated. The tough cellulose fibres of vegetables and leafy greens are thoroughly broken down to release important nutrients such as calcium. When juicing for maximum health benefits, we want to be able to grind the fibres as thoroughly as possible to ensure that the maximum levels of enzymes and nutrients are released from deep within the fibres. The triturating action from the surgical grade stainless steel gears also removes up to 90% of pesticides and agrochemicals on the surface of non-organic fruits and vegetables and it does this by binding them to the waste fibre (see extensive research by Dr. Norman Walker). The fan cooled induction motor exerts a 3 Horsepower force when grinding the produce whilst operating at a slow 82 RPM to ensure no frictional heat is created. This results in maximum juice extraction without the loss of nutrients and enzymes. Due to its low operating speed, this juice extractor is very quiet in operation and it features a thermal cut-out device to prevent the motor from overheating. The machine can only be operated when fully assembled and is put together in seconds ready for immediate use. Hand built completely of stainless steel, with an automated pressure adjustment and featuring the largest feeding chamber of all Twin Gear juice extractors, this is one of the easiest to use and clean and has only five parts which are mostly dishwasher safe (apart from the juicing screen, wooden pusher and the plastic juice collectors). The Angel makes delicious raw milk from soy, nuts and grains and you can also make nut butters with the optional peanut butter screen, all optional extras for this juicer are available below. This machine is for the more discerning user who either doesn’t want their juice to come into contact with plastic toxins; wants the maximum extraction rate; wants a great looking piece of equipment in their kitchen - whichever way, it doesn’t come better than this. * We are aware there may be some confusion surrounding models emanating from the USA distributor "Super Angel". Super Angel is the name of the distributor, not the actual product. Angel the manufacturer produce only 3 domestic models, the 5500, 7500 and 8500. The information supplied by Super Angel the distributor about new models for 2014/2015, warranty and any other claims is specific to the USA and bears no relation to models sold within Europe; these improvements have already been included for several years over here. The USA model has a 110 volt motor and is not suitable for use in Europe. ** Absolutely no warranty for Commercial Use. 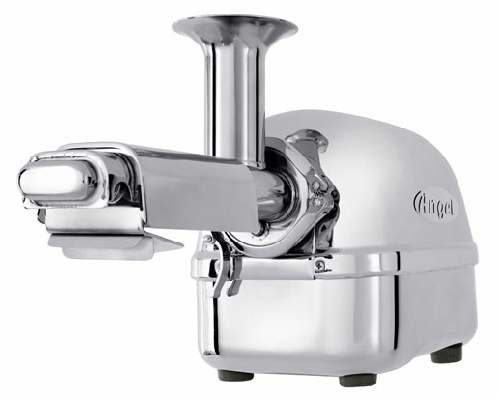 The Angel Juicer 5500 has a domestic warranty of 5 years on motor and 1 year on parts (silicone seals, wooden pushers and cleaning brushes excluded as they are consumable parts with limited lifespan). Juiceland are the official UK distributor and service centre for Angel but we can only service machines purchased from the UK, all juicers need to be returned to the service centre in the country where it was purchased. Currently only Juiceland and EnergiseYourLife offer official UK stock. The video below by our friends shows the Angel juicer v the Norwalk Juice press which is regarded as the most efficient extractor available, you will be astounded by the results. Also known as the Angelia juicer. Super Angel Living Juicer from U.S. Juicers on Vimeo. The Angel juicer 5500 model is hand-built and designed to deliver results of the highest quality that are rich in vitamins, minerals and live enzymes. This quality of juice cannot be obtained from shop bought juice or even from juice-bars using high speed machines. The juicer and all its parts are made completely of SUS-304 (18-10) grade stainless steel giving the machine anti-bacterial properties adding to its unique hygienic construction. It is efficient at juicing vegetables, wheatgrass, leafy greens, seeds and hard fruit and is the best machine we have tested for juice yield. Backed by a 5 year motor warranty and 1 year for the other parts.